This couple had definite ideas of what they wanted, but their budget was tight. I worked with them to come up with ways to provide what they wanted in a home that would not cost as much. Because they were retired it was even more important to design the home to be as accessible as possible. I did this by providing parking on the main level upstairs. I also designed all the most important areas of the home to be on that same level. We even gave attention to the doorways and the kitchen appliances. Their property is in a very secluded location. Their view was very important. They also wanted convenient areas for gardening. 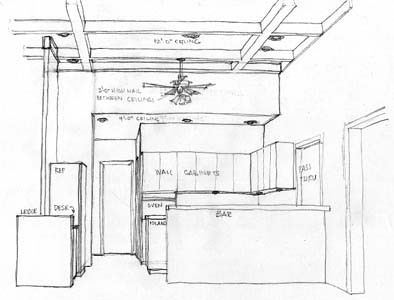 I made this sketch so they could picture what it would look like in the kitchen.